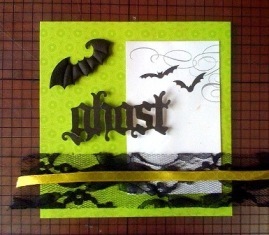 Crazy about handmade Halloween cards and want to make you own? Well, you're in for a lot of spooky fun! 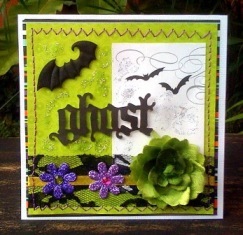 DT Member Kathleen is here to inspire you with one of her Halloween card ideas! Halloween remains as an occasion that I would prefer not to be a part of. LOL I’m not a fan of creepy and frightening sights and stuff, thus, I’m glad that we don’t celebrate them much here in my country. I have to admit though that I would most of the time marvel at the ingenuity of the various costumes and decors I would see on display on selected stores in my country. And I would just ogle at photos shown of Halloween celebration in other countries. Their costumes and decors are indeed wonderful works of art! As a kid, the idea of ghosts would be the most frightening thing for me from the supernatural forces. I guess that would be my concept of Halloween until I got introduced to various fictional characters from other countries that are shown in TV shows. 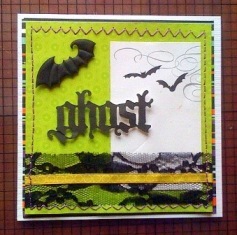 For this, “ghosts” is the inspirational theme of one of my handmade Halloween cards. I hope you’ll enjoy perusing over my Halloween card tutorial. Happy hunting and happy crafting! Here’s me saying, “trick or treat!”. 1. 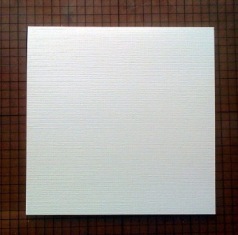 Prepare your white cardstock. 2. 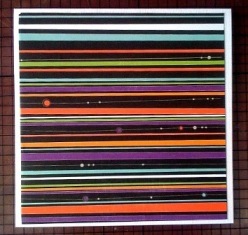 Adhere your darker colored pattern paper on your white cardstock. 3. 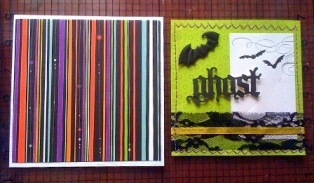 Decorate your 2nd pattern paper before attaching to your card. 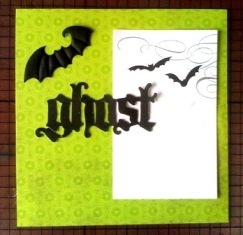 Pop up your bat embellishments and your "ghost" sentiment. 4. Adhere black lace on the bottom of your 2nd pattern paper and adhere your green thin olive ribbon on top of your black lace. 5. 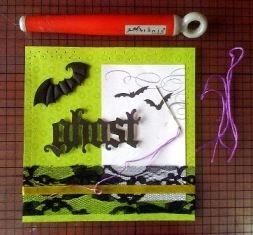 Stitch around your 2nd pattern paper, carefully stitching over your black lace and thin olive green ribbon too. 6. 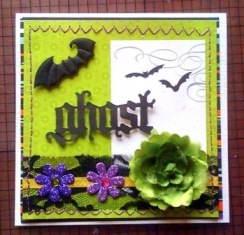 Pop up your fully decorated 2nd pattern paper over your 1st pattern paper. 7. 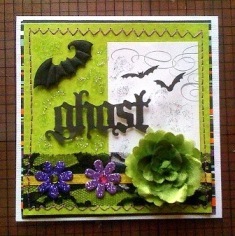 Adhere your big green flower and small purple glittered flowers onto your card. 8. As a finishing touch, apply silver glitters all around your card.